Well when the invite from John Duffy arrived on my email I said to myself `lets give it a whirl' for at my advanced age - at 67 I was probably the oldest basic bog standard crew man taking part - these opportunities don't happen so much more. Anyway somebody had to be aboard to polish John's shoes at each watch change so why not me. So armed with a shoe brush and some lightweight golf waterproofs I jumped aboard. A bit worried about sea-sickness which I used to suffer badly from in my youth which is why this was my very first offshore race. So I was immediately de-moted to navigator / tactician and keep out of the way as much as possible. Not good for the ego as I had thought I would be the best helmsman on the boat - but that illusion quickly shattered as I discovered myself alongside Martin Kirkenterp, gold medallist from 2008 and about four other hot shot sailors. Yahoo, when ever in my life well I ever even speak to a gold medallist let alone spend four days - or 97.6 hrs. to be precise - on the same boat. So the motley crew set off for sea - in a beautiful pea green boat (a little 40.7) - with captain Duffy our wise owl and dipsy Liz our prize pussycat. And what a pussycat - lazy is not a word in her vocabulary, foredeck, mast, trim, galley, pump, everywhere. She worked her balls off - oops wrong expression, for a gal, even an Oz. And also in the pea green boat was Angsar, a dour German with a sense of humour (oxymoron !!!) and a seriously good offshore sailor, young John who took over the seasick duties from me to my surprise (but never once let it stop him in his duties as bowman, and Alan, a cop, who threatened to lock anyone in the head for minor infringements (like parking the boat - he kept imagining he was seeing double yellow lines everywhere) and assured captain John he had brought his handcuffs in his seabag. And there was Jacqui, an English rose, who kept us all cheerful as well as running the pit like a seasoned pony. And Martin who did everything - a powerhouse, steered, trimmed, bailed, fixed, hoisted, dropped, peeled, everything. And of course James McKenzie, (an English Scotsman ?) who is usually my Streaker crew and a top flight ocean sailor. And me. 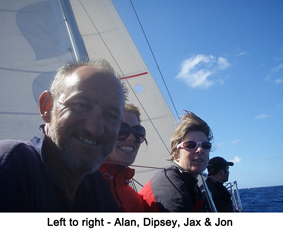 Involved in a minor way in the initial planning of the RORC Caribbean 600 I thought the course appeared to be a little tame compared with the three Fastnets and four Asturias (Bay of Biscay) races I had done before moving to Antigua. Even some of the RORC (English) Channel bashers seemed tougher than what we laid out for the first RORC Caribbean 600 in 2009. Having sold my yacht on leaving the U.K., for two years I had to sit on Fort Charlotte and watch the yachts leave and return. My delight can be imagined when I was offered a Swan 44 to skipper for the race. I had a boat to race and all I needed to do was find a crew. E-mails to all my old crew and many friends in the U.K. produced one lady who had raced with me for 11 years. 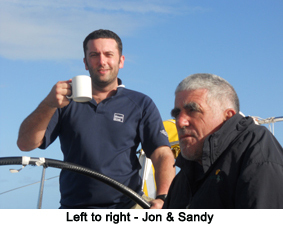 RORC, Crewseekers, the Antigua Yacht Club mailing list and rumours around English Harbour produced a total of fourteen potential crew. Reviewing sailing CVs and interviewing applicants in Antigua I settled on a very mixed bunch which included a German living in New York, an American also from New York, a Danish Olympic Gold Medallist, two Englishmen, both temporarily in Antigua, one of them vaguely known to me from the U.K., a rugged Scotsman who happens to be a CSA Measurer and a young, blonde Australian female - more of her later. That made nine of us and almost nobody had met anybody else. Ten days before the race the Swan was pulled. I now had the crew but no boat. An approach to On Deck Ocean Racing produced a Beneteau 40.7 at a very generous price. The yacht was a little 'tired' and in no way prepared for a 600 mile ocean race. On Deck promised to have it ready for a practise sail the day before the start and, to give then their due, the boat was ready but not tried and tested. Of the five crew flying in from overseas, first to arrive was the young Australian blonde who had included a photo in her CV. The first thing I had noticed about the CV that her picture was back to front. I might have understood had it been upside down. Having agreed to collect any arriving crew at the airport I was fairly confident of recognising her. I couldn't have been more wrong. I drove straight past an image of a 1960's hippy, beads, flowery clothes, pins, etc., etc.. Fortunately I had told her what car I was driving and I had the roof down. I heard my name yelled from behind me. It was the apparition of the hippy. Our Danish Olympian was flying to the U.S. and then taking a next day flight to Antigua which happened to be the same flight as our New Yorker and our German who were staying in an hotel the night before the flight. I put the Dane in touch and he slept on the floor of their hotel bedroom. The U.S. flight was due to arrive two hours after the flight bringing my ex-crewmember from the U.K.. Conveniently, the U.K. flight was an hour late and the U.S. flight, half an hour early. Less than 48 hours to go and the crew was complete. Many apologies to all our supporters for the lack of blogs from the boat! We have a good excuse though....we have been racing very hard! In actual fact down below during the day provides us with intense heat that makes Hydrocarbon a 50 foot powerful and fast sauna! It even has a rocking mechanism fitted for good measure! We try and spend as little time down below as possible as just sitting at the chart table for five minutes results in buckets of sweat and a fast track to dehydration! What about at night you may ask! Well not much sleep happens during the day due to the temperature so I have to say that we all sleep like babies....some do snore louder than others, so nothing really changes there! Last year toward the end of Round Britain and Ireland race I promised you all new adventures for the teams at Sailing Logic and I think we are certainly delivering those! Sailing in the Caribbean has its own challenges and moving away from my beloved Puma onto new boats adds a new dimension to the learning curve. 'Rome was not built in a day' and it is going to take a season to learn the new skills and understand the idiosyncrasies of new waters before we get back up to the top. Having said that, we are putting in a very solid performance in our first offshore race away from Puma and Northern European waters that I feel we can all be justifiably proud of. We have been up and down the leader board throughout the race (even leading class at one stage) but lost some miles at a critical point of the race, which are now looking difficult to recover. The sailing in the Caribbean is absolutely awesome, so totally different to the UK waters that we are so used to. I have worn nothing other than shorts and a t-shirt for the past three days and three nights - that is due in part to the fact that I have not got any foulies with me! (who guessed that one on facebook then)? It was not entirely my fault though; I think the same person that removed the saucepan lids and cutlery probably believed they were unwanted for the race and just excess clutter and weight that I keep banging on about! So during the day I am very warm and wet and at night I am cold and wet! The seas are as blue as in the brochures, the sun is as bright and every day it blows a near perfect 15 - 20 knots of breeze. I say near perfect as just like in the UK the wind does blow from the wrong direction sometimes and we find ourselves beating to windward. This is simply just not good for sunbathing! We are racing downwind at 11 knots now though, so making the best of the opportunity to get rid of the tan lines! The sunbathing (no not really Chandler, we are working hard) was only briefly interrupted an hour ago when we were graced with the presence of a magnificent whale as it wagged its tail above water, waving at us, a few times before disappearing to the depths below. What an amazing creature, awe inspiring but it does provoke anger at the way they are still being cruelly hunted in some parts of the world. I have asked a few of the team if they would prefer to be down below sweating and struggling with the heat of the Caribbean or donning thermals in a vain attempt to keep warm in the English Channel! With the exception of me, it is pretty much unanimous that the intense heat is preferable! I just love it all; the hot, the cold the storms, the trade winds, the sunshine and the rain. It is all incredibly challenging but always for different reasons. What does not change anywhere is the competitive nature of yacht racing, the camaraderie, the love of the sea and lust for adventure that we all possess. And the final thing that will be the same the world over is the taste of that first beer, the exchange of stories with fellow competitors and the realisation that none of it was quite as bad as it may have appeared at the time! Windrose finished at 04.00 after a tough beat from Redonda. The crew gelled together to produce a great piece of teamwork to gybe spinnaker hoist foresails and drop kite all in a short space of time. On a schooner it's very difficult to pull off. Well done the RORC team. All will have great memories of this race for a long time. Welsh wizard signing off. Windrose has increased wind on run to Redonda doing 12knots over ground with all downwind sails flying including a foremain staysail. Ropes everywhere and easy to trip up in dark. Waiting for moon to rise to make it easier to get round the boat.